We, as member of the CosmoPolitical Party, share the following political objectives and guiding rules for action. Trans-national democracy is a democracy uniting citizens, and taking action, beyond national, linguistic and cultural boundaries. We believe it to be possible because what unites humans, and the common issues that they face, are greater than what separates them. We implement it at the scale of the European Union because we believe that, despite all its weaknesses that we acknowledge, is the first existing trans-national democratic institution, and the geographic space where we intend to implement this trans-national democracy, both in political institutions and in our internal operations. Social justice is a situation where every citizen is assured to live in dignity from his / her work, for life, is confident in his/her future and in that of his/her children, and where economic inequalities in income and in inherited wealth have been drastically reduced. Environmental sustainability is a production and consumption model where: (1) the climate is maintained in a stable state (1.5°C warming), compatible with the long-term preservation of the agricultural systems that feed humankind; (2) every renewable resource is used at or below the rate at which it can regenerate itself; (3) every non-renewable resource is used at or below the rate at which a renewable substitute can be developed; and (4) every pollution stream is emitted at or below the rate at which it can be absorbed or made harmless. Social cohesiveness, inclusiveness and equality. We state the right for all to feel and be safe and confident about his/her future, specifically to have a stable employment, under conditions enabling to live decently from one's work. Human rights, as described in the Universal Declaration of the United Nations1, which are equally accessible to all humans without discrimination (Art. 1 and 2), and include formal rights, such as protection of life and of personal integrity (Art. 3, 4, 5), of privacy (Art. 12), the protection of law (Art.6 to 11) and of a nationality (Art. 13 and 15), freedom of movement within a State and right to asylum (Art. 13 and 14), right to marriage (Art. 16), to property (Art. 17) freedom of thought, conscience and religion (Art. 18), of opinion (Art. 19), of association (Art. 20), right to democracy (Art. 21), and social and economic rights, such as social security (Art. 22), right to work, for a decent pay, and to join a trade union (Art. 23), to limitation in working hours and to periodic holidays with pay (Art. 24), to a decent standard of living (Art. 25), to education (Art. 26), to culture and science (Art. 27). Rule of law. Law is the only tool available to the weak and to the poor to uphold their rights against the rich and the powerful. It must apply and be accessible equally to all. It must provide redress opportunities, legal security and the predictability of legal decisions, equally for all parties. Democracy. Democracy has a value in itself. It is the political system that embodies human dignity and equality in the political decision-making process governing our collective future. It is because all humans are equal in their rights that they are equally legitimate to participate in taking collective decisions. Every person must be able to participate in the initiative of public policy proposals, in their amendment and in their ranking in priority order. The digital on-line platform and the organisational model used by the CosmoPolitical Party are in themselves an attempt to embody internal democracy in software code2 and in human-based procedures. Sustainable development, which we understand as follows. It is our duty to ensure every inhabitant of the planet decent living conditions, compatible with the finite nature of all biological, physical and geological resources necessary to a human civilisation, without compromising the ability of future generations to do the same. We understand "development" as the steady improvement in the quality of living conditions and in the efficiency in the usage of all resources (energy, raw materials, soil, water, human work, human capabilities). This improvement is based on the accumulation and the maintenance of all forms of productive and cultural capital (natural regeneration capacities; human competencies; human culture; infrastructures, machinery and networks; scientific, technical and institutional knowledge; coordination capability; institutions, laws, regulation and standards), while operating with decreasing flows of matter and energy. In the medium term (2030), we take seriously the 17 Sustainable Development Goals of the United Nations3, to be provided to all humans: (1) end poverty; (2) end hunger; (3) ensure healthy lives; (4) ensure education; (5) achieve gender equality; (6) ensure sustainable water supply and sanitation; (7) ensure access to sustainable energy; (8) promote sustainable economic growth, employment and decent work; (9) build infrastructure, promote industrialisation and innovation; (10) reduce inequalities within and among countries; (11) make cities inclusive, safe and sustainable; (12) Ensure sustainable consumption and production patterns; (13) prevent climate change; (14) conserve the seas; (15) protect terrestrial eco-systems; (16) build peaceful and inclusive societies, just legal systems and accountable institutions; (17) implement. Education. We consider education as being the essential tool for humans to emancipate themselves from ignorance, from prejudice, from social and ethnic determinisms, and from oppression. Education provides the capabilities and knowledge for humans to evolve and adapt, individually and collectively – which will be of utmost importance in a century of massive, structural change. Education is also one's only truly unalienable asset. Peace, between nations, between members of society and within ourselves. Peace can only last if justice and truth prevail. We implement this liveable and desirable society in a long-term 30-40-50 Roadmap, with three concrete milestones. All citizens, whatever their national, cultural or social origin, participate in policy- and decision-making n the European Union. The European Union is a powerful political player, able to impose its democratic decisions to multi-national corporations and to the richest 1%. Every citizen is assured to live in dignity from his / her work, for life. Economic inequalities in income and in inherited wealth have been drastically reduced. All citizens are confident about their future, and are ready to engage in the changes brought by the transition to sustainability. Unemployment rate is below 2% (frictional rate). Long-term unemployment rate is 0%. All incomes are within a 1 to 3 ratio after social and fiscal contributions and benefits. All inherited wealth lies within a 1 to 5 ratio after fiscal contributions. The European Union is on track and on time to limit global warming below 1.5°C (net-zero emissions). It has stopped deteriorating its natural capital (soil, freshwater reserves, biodiversity). Emissions of greenhouse effect gases related to EU consumption have reached a net zero level. Net-zero consumption of soil and of freshwater reserves. Biodiversity loss has reverted to pre-industrial rates. 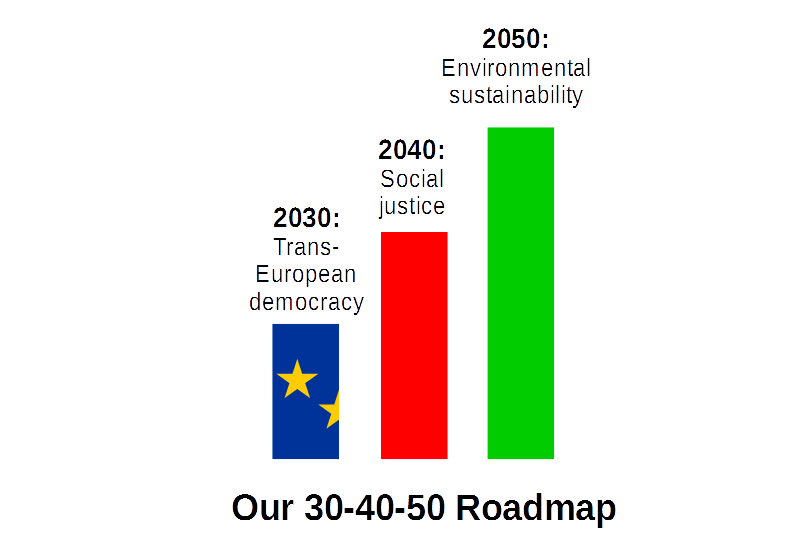 In our views, the three components and milestones of our 30-40-50 Roadmap to a liveable and desirable society, trans-European democracy, social justice and environmental sustainability are intimately inter-linked and must be pursued jointly. Neither social justice nor democracy are possible in environmentally unsustainable societies. In the short term, the first victims of environmental destruction are the poor, who are forced to live in the polluted, noisy, isolated and unhealthy places created by the unsustainable individual and collective consumption patterns of the rich and of the middle class. In the longer term, the shortages of food, fuel or other material goods brought by unsustainable life-styles destroy the livelihood of the whole population. At the end, such societies collapse in the dreadful chaos of a fight for bare survival4. Said differently and more brutally: no positive societal value such as social justice or democracy can exist if human society is destroyed. Reciprocally, no environmental sustainability agenda can be implemented in socially unjust societies. This is because inequalities and precariousness generate (1) social and political conflicts, (2) short-termism and (3) ostentatious consumption, the exact opposite of what is needed for a transition to sustainability. Our detailed argument is the following. First, the transition to an environmentally sustainable society is a fundamental transformation. It changes the way we produce and consume, it impacts our cultures and our even our dreams for the future. It demands to agree on the sharing of immense costs, benefits and risks, among all of us, all around the globe, in a very short time. Achieving this level of political agreement among good-willed people is a huge challenge in itself. It becomes impossible when anger, frustration and fear, created by inequalities and precariousness, put the very legitimacy of democratic institutions (whose purpose is to solve conflicts peacefully) in question. Second, for people living in precariousness, the future is very limited, sometimes for them it's even about finding food from one day to the next. Sustainability policies on the other hand develop over much longer time – often decades. Third, in unequal societies, many consume wastefully, and ostentatiously5. This is rational: it is an attempt to show to others that the person belongs to the rich and the powerful, in a society where only them (or those that make believe they are) are safe and secure, while the poor and the weak are being trampled upon. This ostentation is the opposite of the frugal consumption that we need for our societies to be environmentally sustainable. These two deep social and economic transformations, towards social justice and towards environmental sustainability will (1) severely impact the concentrated wealth and power of multi-national corporations and of the rich and very rich global elite (the "1%"), and (2) require political compromises at large scale between very divergent and yet legitimate interests, which will be difficult even among good-willing partners. Overcoming the resistance of the global oligarchy is impossible with weak, fragmented political powers such as the European States separately. Only a strong, democratically legitimate and unitary European Union bears enough power to impose its decisions to multinational corporations and to the richest 1%. Only a truly trans-national democracy, of which the European Union is a prototype, can legitimate the political agreements at large scale necessary to successfully address the global challenges of the 21st century. For all these reasons, we pursue the three milestones of our 30-40-50 Roadmap to a liveable and desirable society, i.e. trans-European democracy, social justice and environmental sustainability in parallel, inseparably from one another. The political objective of a liveable and desirable society as described above, and the 30-40-50 Roadmap to achieve this objective,constitute the minimal agreement required among the members of the party. They build the ideological framework within which we place our reflection and our action. Each Public Policy Proposal produced by the CosmoPolitical Party is expected to comply with them. This level of compliance is an element that members are being requested to assess when ranking policy proposals in priority order. We recognise that these political objectives may conflict with each other, and that the purpose of political choice is that of choosing between equally legitimate, but contradictory, requirements. We work on issues and propose public policies. In our views, politics is not a matter of general declarations, resolutions or motions. Its purpose is to act, and to transform the world and society. Democratically elected public authorities have a range of essentially three tools at their disposal: regulation, taxation and public spending. They are powerful, if appropriately used, at the right scale. Societies are faced with issues of various magnitude, scope and time durations. Our duty in the CosmoPolitical Party is (1) to identify the issues that we consider deserve being treated in priority, and (2) to democratically define and to implement the public policies compliant with our political objectives, and best suited to solve these issues, in a problem – solution approach. We support radical reforms to the current social, economic and political order. The only realistic and honest means to eradicate the old order is to define the new one with which to replace it. We build credible alternatives, which are both technically valid (the outcome is indeed what was sought, and the social benefit is maximised) and politically legitimate (the interests and values of all have been taken into account). We concentrate our political action where its transformative power is the greatest. We aim at exerting government responsibilities. We consider our social role as a political party as follows: (1) to define and publicise our political programme (i.e. the list of public policies that we support, ranked in priority order), and to defend it in the public sphere; (2) to participate in political elections, with the aim of being elected to positions of responsibility; and (3) to implement this political programme once elected – thereby bearing full political responsibility for our choices and proposals. Our primary targets are those elections and position of responsibility taking decisions at the scale of the whole European Union, and where we leverage our fully trans-national structure: the European Parliament,where we aim at creating a political group. We also aim at participating in national, regional or local governments, because they face common issues, which deserve being solved using common solutions defined at large scale, and implemented in a coordinated way. In addition, Member States in the European Union govern the major fraction of public spending6, and some essential tools of social justice, such as the social security systems7. Political action at national scale and below is thus necessary for us to implement our political objectives. Finally, the national governments build the Council of the European Union, the upper chamber representing the Member States, on a par in the ordinary legislative procedure with the Parliament representing directly the people. Implementing our political programme at the scale of the EU thus requires to be present in the Council as well as in the Parliament. 4Such disastrous scenarios of civilisational collapse have already taken place in the past, as demonstrated in Diamond, J. “Collapse: How Societies Choose to Fail or Succeed”, Penguin books, 2011. 6The budget of the European Union in the period 2013 – 2020 is less than 1% of its total GDP, whereas the public spending of Member States ranges from 20 to 45% of their national GDP.